Chronic Lyme Disease Fact or Fiction? Is there such a thing as Chronic Lyme D isease? Is Lyme Dsease, as some critics say a bogus diagnosis? Why is there such controversy surrounding the issue? Why can’t physicians agree? Are the physicians who treat Chronic Lyme “fleecing” unsuspecting patients, or are they courageous mavericks “thinking outside the box”, willing to question the status quo for patients who are desperately ill and in need of answers? Let’s begin with some clarification, Chronic Lyme Disease is now known as Persistent Lyme Disease as opposed to Post-Lyme Syndrome. Post-Lyme Syndrome is the presence of continuing symptoms after a patient recovers from acute Lyme disease. It affects up to 10% of acute Lyme patients. For those physicians who do not believe in Persistent Lyme Disease, it is not considered a chronic infection but the residual damage from the acute disease. It behaves more like an autoimmune disease than an infectious one. Persistent Lyme Disease is seen as an ongoing infection and thus amenable to antibacterial treatments by those who believe in its existence. In the conventional medical world there are two schools of thought. One is IDSA (Infectious Diseases Society of America) who does not believe in Chronic Lyme as a diagnosis. The other is ILADS (International Lyme and Associated Diseases Society) which does. IDSA is made up of Infectious disease doctors and ILADS consists of MDs, NDs, ARNPs, nurses, etc. IDSA is 10,000 members strong, ILADS is much smaller but growing. Interestingly, both quote the same studies in defense of their positions. The data is just interpreted differently. IDSA believes a 1-time dose of antibiotics is appropriate for a high-risk tick bite. ILADS believes it might be more appropriate to treat for up to 20 days with an antibiotic for an acute tick bite. If there is an erythema migraines rash (bulls-eye rash), IDSA recommends treating with antibiotics for 2 weeks and ILADS recommends treating for up to 4-6 weeks. 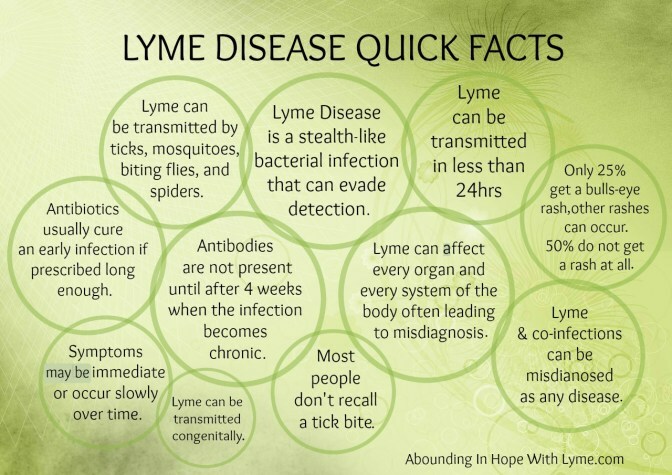 ILADS also believes you need to treat for possible co-infections of Lyme at the same time. IDSA recommends clinicians be aware of possible co-infections. Ticks can transmit other bacterial infections at the time of a bite in addition to Lyme. To date, the known co-infections include: Bartonella, Babesia, Anaplasma and Ehrlichia. In the case of Persistent Lyme ILADS recommends treatment with antibiotics and IDSA doesn’t recognize Persistent Lyme Disease. The controversy between IDSA and ILADS includes IDSA’s argument that using continuous, open ended antibiotics can cause antibiotic resistance, hurt the gut microbiota and isn’t necessary, as any symptoms post-acute Lyme disease is Post-Lyme Syndrome, and should be treated like an autoimmune illness. ILADS counters that treating a chronic bacterial disease like an autoimmune illness will suppress the immune system and cause the bacteria to proliferate. ILADS believes in treating Persistent Lyme with open ended antibiotics until the bacteria is eradicated enough, and until the patient is well, while also addressing issues that may occur because of using antibiotics (e.g. C. diff. infections and probiotics as a prevention). ILADS points to other bacterial diseases that are treated with long term antibiotics as the standard of care like resistant tuberculosis for example. The biggest issues for the controversy are: 1. The lack of awareness of Lyme disease and its presentation. Most people (including physicians) are aware that ticks can give you Lyme disease from a bite. However, most people (including physicians) think only a certain geographic area in the U.S. have Lyme, specifically the Northeast. These same people might also believe the tick needs to be attached for at least 24 hours and that you must have an erythema migraines rash (bulls-eye rash) plus be acutely ill to have Lyme disease. The truth, is you don’t. Lyme disease has been documented in every state, the tick can be attached for less than 6 hours to transmit Lyme, and a bulls-eye rash only shows up in about 30% of those bitten by a tick with Lyme. In addition, the bulls-eye rash may be mistaken for other benign rashes such as tinea corporis (ring worm). 2. Conventional, sensitive diagnostic testing to detect Lyme is sadly lacking. The 2-tiered Lyme antibody test with western blot (the test used by physicians not as familiar with Lyme) is only 48% sensitive. Its specificity is at least 90%, so there are much less false positives than false negatives. 3. The 2- tiered testing is not for diagnostic purposes but for surveillance purposes only, so very strict criteria must be met to record a CDC positive Lyme result. If the physician doing the testing sees the result as negative they may believe they did due diligence and ruled out Lyme as the diagnosis. Lyme disease is, and always has been, a diagnosis that is made based on clinical judgement not testing. If you are not aware of this, you may make decisions based on faulty or incomplete information. While the controversy continues, the CDC reports increases in the number of Lyme cases in the U.S. Over 300,000 new cases are identiefied and reported yearly. This number is for surveillance only, and likely severely underestimated. Since Lyme was first discovered in 1981, at least 15 new tickborne pathogens have been identified. The evidence base for treating Lyme disease is best described as sparse, conflicting and emerging. In fact, most recommendations in Infectious Disease medicine are generally based on low-quality evidence probably accounting for why there are at least 25 diseases including Lyme that have conflicting guidelines. Using the GRADE system (Cameron, et al), recommendations for treatment should consider not only the quality of the evidence but also the balance between benefits and harms and patient values and preferences. When quality of evidence is low as in Persistent Lyme Disease, recommendations should identify a range of therapeutic options and acknowledge that different choices may be appropriate for different patients. The goal of medicine is and should be disease prevention, treatment to cure when possible, improving quality of life and preventing disease progression. When the evidence isn’t clear, there is no established standard of care because of conflicting guidelines and patients are suffering with an illness that is not diagnosed properly or not responding to conventional treatments, physicians need to make a cost-benefit analysis with patient input and use their best clinical judgement to treat. Evidence assessments and guideline recommendations in Lyme disease: the clinical management of known tick bites, erythema migraines and persistent disease. Expert review of Anti-Infective therapy. Cameron DJ, Johnson LB, Mahoney EL. « TBI (traumatic brain injury) and hyperbaric oxygen treatment.